Solar panels at Arts Center of Cannon County. Area residents are ‘taking it to the streets’ over rising energy costs as part of the Oct. 8 Middle Tennessee Solar Tour. The tour stretches from Fairview to Woodbury, up to Gallatin and down to Franklin, and is part of the 16th Annual National Solar Tour hosted by the non-profit American Solar Energy Society (ASES). Sponsored by LightWave Solar, the Middle Tennessee Solar Tour runs Sat, Oct 8 from 10am-2pm, and the Arts Center location will have solar presentations at 10:15, 11:15, and 12:15. The self-guided tour showcases five energy efficient homes, three businesses and the Arts Center whose owners are seeing ample economic and environmental rewards from their solar electric systems. It is one of hundreds of tours throughout the country that afford participants the direct perspectives of businesses, home owners and installers about the costs, processes and benefits of going solar. Solar systems qualify for an enticing 30% federal tax credit and businesses receive accelerated depreciation benefits. TVA offers a one-time $1,000 rebate and a premium payback rate for all solar generation. Many sites on the tour have little or no electric bill and some see a credit that rolls over each month. If the credit remains after one year, the utility sends a check! Toss in the savings of fueling an electric vehicle with free solar energy (a solution known as EV-PV) and the savings continue. The tour’s Antioch location features EV-PV with a 100% electric car, the Nissan Leaf. The open house tours show how people are using solar to 1) slash monthly energy bills, 2) reap rich tax benefits, 3) create green jobs, 4) reduce harmful carbon emissions and assert their energy independence, while improving property values and creating more sustainable communities. The tours also give consumers a glimpse at how a variety of solar systems look in and around structures with different architectural styles. 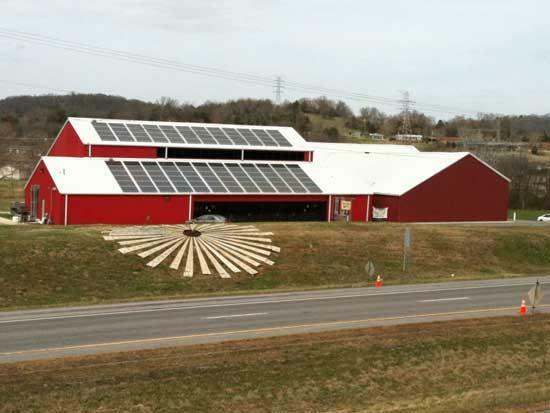 The Arts Center’s solar installation was awarded the 2011 TN Governor's Energy Leadership Environmental Award. The project includes a 29kW system, a time lapse video of the installation, and real time energy production display in the lobby. The event is free and open to the public. For tour details and map, visit www.lightwavesolar.com. Founded in Nashville in 2006, LightWave Solar is the largest area installer of residential and commercial solar PV systems in Tennessee. LightWave Solar has the most NABCEP (North American Board of Certified Energy Practitioners) certifications of any solar company in Tennessee with five NABCEP-certified Solar PV Installers and one NABCEP PV Technical Sales certification. LightWave Solar is an active member of the Tennessee Solar Energy Industry Association (TenneSEIA), Tennessee Environmental Council and the US Green Building Council of Middle Tennessee.